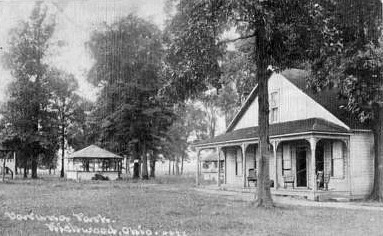 Richwood, the Ohio village where I grew up, was a dense forest when first settled in 1832. It quickly became a trading and manufacturing center for the farms being carved out of the surrounding plains. 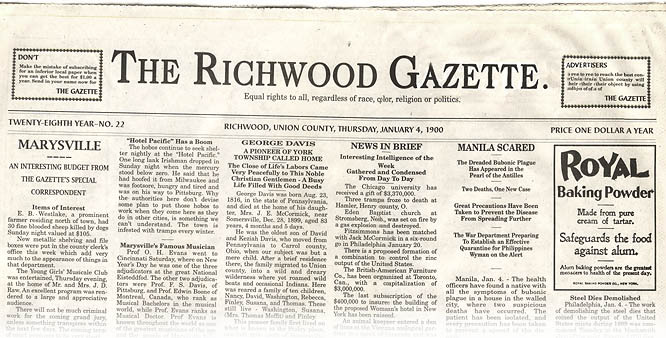 By 1872 the growing town had its own weekly newspaper, The Richwood Gazette. The paper has always been interested in history. One of its features, variously known over the years by such titles as "Dad Says" and "In Retrospect," reprints items from past editions, such as 100 and 75 and 50 and 25 years ago. The more recent items remind me of events from my own life. But I also find the older stories fascinating, a glimpse of an earlier version of the town. For example, on October 30, 1873, the year-old newspaper reported on local construction: "All the improvements in progress in Richwood are being pushed with a view of having them completed before winter fully sets in. It will require unusual activity on the part of some of the mechanics to get the large number of buildings enclosed before it gets too cold for outside work. Already we have had snow, and the fires are being kindled." Or on January 31, 1901: "Sheets of the census bulletin for Ohio shows that Richwood's population in 1900 was 1,640, as against 1,415 in 1890." Or on July 16, 1908, the paper bemoaned the interruption of the town's light-rail mass transit service. "Ever since the CMS&N interurban tracks were cut on S. Franklin St., business has been greatly damaged in Richwood. It is impossible to get to town from the south without walking a half mile or more or driving to town. The people south of Richwood have become accustomed to stepping on the interurban and coming to town for a few cents while their horses stood in their stalls resting after a big spring and summer's work. ...The contractors claim the cars will be up and running about August 1, which will be good news for all concerned. We can't imagine how other towns get along without an interurban altogether." Here are some of the items from a quarter-century period, 1880 through 1905. Farmers are already commencing to engage help for the coming harvest. Work is more plentiful than workmen, and the idler who "can't get work" now must dodge employment at every street corner. Sunflowers are worth one cent a piece in New York City. Just think of the many fortunes that will go down with the frosty season just because we are unable to get our sunflower crop to market. A few days ago, William Fish and William Carter attempted to butcher a hog belonging to the first named gentleman and proceeded to bang away at said hog with a rifle. The first shot struck Mr. Hog in the nose, causing his escape, jumping a fence and swimming up Rush Creek. Fish and Carter, in hot pursuit, shot until they exhausted their supply of ammunition and were compelled to call on Daniel Mifflin, an old-time hunter of some notoriety, who finally brought Mr. H. to bay with the third shot. Fish and Carter think of going west in search of larger game. John Strahl, north of town, informs us his wheat is threshed and said it turned out 27 bushels per acre. Mr. S. also complimented the Snare Wheat Separator very highly and says if he had not cleaned his seed wheat with it last fall, his crops would have been mostly cheat. C.D. Sidle has sold his farm north of town to G.W. Handley. The farm contains 132 acres and the price received was $10,560. Mr. Sidle has a notion of Southern Kansas. Joe Shipley, of York Township, raised the biggest crop of rye. He threshed about 320 bushels off of twenty acres and sold it at eighty cents per bushel. They caught the market on the fly, as it were. Rev. A.D. Hoover, west of town, left a twig cut from one of his pear trees at this office, which measured eleven inches long and contained eleven nice Bartlett pears. He says this has been a great year for pears and that every tree is full of fruit. Last Tuesday afternoon, neighbors and friends of Orville Case, three miles west of town, turned out and cut twelve acres of his corn and nicely placed it in shocks  in just two hours and thirty minutes. Thirty-one men showed up to help the ailing farmer. The farmer is more out of the reach of trouble than any other man in the world. He can burn his own wood, eat his own meat, eggs and johnnycakes, and sleep under a roof that is not mortgaged to any corporation. When America became involved in World War I, the nation needed to increase agricultural production. However, there were fewer hands to bring in the crops because many young men had been drafted into the military. The overworked farmers who remained were in the fields from dawn to dusk during the growing season. They didn't have time to go into town to transact business during banker's hours in the daytime. Therefore, according to the Gazette of May 3, 1917, "the banks in Richwood have arranged to keep open from seven until nine o'clock from May 1 to November 1." E.S. Curry, agent for the Oldsmobile  Light Run-about, $650; Touring Run-about, $750; Delivery Wagon, $850; Touring Car, $950. Will sell my Light Runabout in good condition at a bargain as I wish to get a larger machine. As the result of the accident which happened to Mrs. Jane Lake on South Franklin Street on June 7, L. Hubbard was fined $25 and costs by Mayor M.W. Hill Tuesday night. The defendant was charged with violating Ordinance No. 225 in that he propelled his automobile through the streets of Richwood at a greater rate of speed than eight miles per hour. Why was the speed limit so low? Traffic patterns were rather chaotic in those days. A motorist had to dodge trolleys and horse-drawn wagons, not to mention pedestrians and bicyclists crossing the street in any direction. Take a look at this footage, which was filmed in 1905 in a slightly larger town. The 24th annual Farmer's Institute adjourned after being in session for two days. Owing to the careless handling of automobiles, which is endangering life and property, a resolution was adopted requiring Union County's representative to use his utmost influence to procure the enactment of a law regulating the speed and handling of all horseless carriages. Cooper Brothers have added a new feature to their bakery and restaurant, by placing on the road a new delivery wagon to deliver free of charge to all parts of town. Go to Landon's for 5¢ hats, 5¢ hose, and the best 5¢ calico in the market. The railroad depot was also on North Main Street. My guess is that a "sample room" was a place for a traveling salesman to display samples of his wares. The Beam House, North Main Street, Richwood, Ohio, A. Paris & Son, proprietors: This house is furnished to provide ample accommodations for the traveling public. Great care is taken to render suitable attention to all who patronize the house. Good sample rooms on first floor. A time lock, costing $300, has been placed on the money vault of the safe in the Richwood Deposit Bank. It is a wonderful and beautiful piece of machinery, from the Consolidated Lock Co. of Cincinnati, and is of the finest make. With this improvement, the safe of this bank is said to be the most complete bank safe in the county and one of the best in central Ohio. H.C. Hamilton has now 150 cords of seasoned wood inside the corporation limits, out of which he will fill all orders for winter supplies at $2.50 per cord  four foot wood. Note: The last two named only agree to close until 2 o'clock p.m.
Why did all these businessmen, including Gazette printers Smith & Worden, have to formally agree to close for a few hours on a holiday? Was it for midday Thanksgiving services in the churches, or midday turkey dinners at home? There were probably many among them who wanted to close but were afraid to do so because of the competitive disadvantage. Any merchants who stayed open would get all the commerce. So the businessmen decided to draw up and publish a cease-fire agreement. For competitive reasons, all the merchants welcomed the throngs on Saturdays as well. Richwood always has a crowd on Saturday afternoon, no matter what the weather. Although it had rained for more than 24 hours, the roads in the country were very heavy and the village streets in bad condition with ice and muddy water, the usual crowd was on hand. At 3 oclock, Miss Carrie Hamilton counted the vehicles hitched on Franklin Street and the side streets, found the number to be 229. Not a bad showing for a stormy afternoon in January. Much later, when my father went into business in 1952, the stores in Richwood all stayed open on Saturday night. In fact, it was the biggest night of the week, when the farmers came into town to shop  or to look. Our auto dealership was so crowded in the 50s that my father couldn't even take a supper break; my mother and I would bring him sandwiches and coffee. But although there were throngs of people looking at cars, they were all "just looking." We didn't close many deals on Saturday night. Finally, in the summer of 1956, my father decided to go against the local tradition. He would close at noon on Saturdays. We advertised these new hours for a month in advance. Once the new policy went into effect, we had to enforce it by taking a trip out of town every Saturday afternoon. Otherwise, "lookers" would pester us at home to ask how much we wanted for that '53 Chevy on the used-car lot. Friday afternoon, some forty of our citizens went to Prospect to see their gas well shoot. They saw it and heard the dull thud when the explosion went off, but they didnt see or hear the gas shoot up. The gas wasnt there. It was a bad disappointment to our boys, but a worse one for the Prospect people. If you happen to have any loose dollars, it will pay you to bring them to the Boston One Price Clothing House for investment this week. Our store will boom with bargains not found elsewhere. The Boston One Price Clothing House is located in the Parsons Building. Comers have just received 1,000 yards of new ribbons; ladies cashmere vests 47 cents at Hornbicks; full line of stiff hats, soft hats and crushed hats at Boston One Price Clothing House and at Dobies, if you buy a dollars worth of goods, you get a present worth from five to ninety cents. There are nine Hebrews living in our town of whom three are among our most esteemed citizens and businessmen. There are no Hebrew synagogues in Union County. A new window is going in the south wall of the Parsons block to let light into the store occupied by Mr. William Glick. Many sellers of ready-made clothing do not desire much light in their store rooms, but Mr. Glick handles goods of such quality that he is willing to let customers have the privilege to examine critically the goods they buy and runs no risk of misrepresentation. We know of no town that has a more honest class of business than has this village. Gamble Shields, who has been the popular and efficient agent at the Ohio Central Lines depot, has resigned his position after over six years of faithful service, or ever since the road was built in 1893. Mr. Shields was relieved from duty Tuesday by Mr. C. C. Simmons, the agent at Raymond being advanced to the place. Gamble worked hard for the company and put in about 18 hours every day for the mere pittance of $50 per month. His small salary is one of the reasons of his resigning his positions. Mr. Shields has formed a partnership with Geo. M. Wilber, the well known grain merchant of this city, under the name of The Shields Wilber Co. The new company will be ready for business at their new elevator at Main Street crossing, on or about January 10. The new elevator will have all modern improvements and its erection cost a vast sum of money. The Gazette referred to the principal north-south street as Main Street prior to mid-1900, but it had always officially been Franklin Street, after Benjamin Franklin. It was so named following an 1832 survey. The first plat showed three streets crossing three. The other north-south streets on either side of Franklin were named Fulton and Clinton, presumably to honor the late inventor Robert Fulton and the late New York Governor DeWitt Clinton. The main east-west street was called Ottaway, later corrected to Ottawa, an Indian tribe that Andrew Jacksons administration was relocating from Ohio to Kansas. Ottoway was flanked by Blagrove and Bomford streets. Those were named for the people who sold the land to the developer: landowner Parthenia Blagrove and her attorney George Bomford. Sam Berkowitz sold his clothing store last Thursday to Jacob Rosenberger of Cleveland, who will take charge of the business the first of February. The location on the corner of Franklin and Ottawa Streets is a good one and Mr. Berkowitz has done well there. He expects to retire from active business and look after the improvement of his farms and other property. Bert Spring has sold his interest in the North Franklin Street grocery to his father, T. Spring, and formed a partnership with N.A. Adams, the baker. The two latter gentlemen have purchased and taken possession of a bakery in Gallipolis. Our loss is their gain. W.A. Biddle has purchased an automobile to use in his business and is now prepared to go anywhere on short notice and make photographs of stock, residences, family groups or gatherings of any kind. Phone him at 163 when you have anything you wish photographed. Parties desiring to have their buggies repainted will do well to call A.A. McGee, who has the services of an expert in that line engaged. Bring your buggies early so the paint can season before exposing it to the weather. The Gazette promoted the businesses of its local advertisers, of course. Thirty-seven years later, the March 5, 1942, issue reminded readers why they should shop in the town where they lived. The home store is the place where customers get the most personal attention. They come in contact with merchants and sales people whom they know personally. It is more satisfactory than to buy of strangers. The home store people know that their prosperity and success depend upon giving satisfaction to these home people. The store cannot afford to have anyone leave its place in a dissatisfied mood  or to feel, after goods are taken home and used, that they were not as represented  so they will go the very limit to give satisfaction. Do not forget that Mr. Green will be here Tuesday evening and Wednesday of next week, with a party of boys for whom good homes are wanted. Here's an opportunity for some benevolent people to do good. The company of children in charge of G.T. Green, of the Children's Home, Cincinnati, arrived on Tuesday evening as advertised. They are bright-looking children and many of them readily found good homes. At the time of going to press, thirteen of them had been taken into homes. The several Christmas entertainments given by the Sabbath Schools in this place as announced last week were all largely attended. The M.E. folks had a snow house which contained the presents; the M.P. 's, a boat loaded with presents; the Presbyterians, an old-fashioned chimney from which Santa Claus emerged in ideal style; the Disciples, a treat for the children; and the Baptists, a tree. All were complete in themselves so that invidious comparison cannot be drawn. The ladies of Richwood and vicinity will meet in the rooms over I.F. Gates' Dry Goods Store at one o'clock today (Thursday), to spend the afternoon in making garments to send to the flood sufferers. All are earnestly requested to lend a helping hand. The goods have been provided, and willing hands to sew are all that is needed. The M.E. Church parsonage committee has received subscriptions sufficient to enable them to build a very commodious and handsome dwelling on the church lot, and they are already looking up designs and making arrangements to commence the building soon. The committee succeeded better than at first hoped, receiving many liberal subscriptions. The resident pastors have arranged that on and after next Sunday evening, till further notice of change, instead of the usual evening services at several churches, a union service will be held in Hill Orchard at 6:30 o'clock for which one of the church bells will be rung half an hour in advance. The service will consist of sermons in rotation by the pastors and purely congregational singing from the Gospel Hymns Combined. It is hoped this will be much more pleasant than in-door services these warm summer evenings. If our churches want revivals attended, please make the rooms comfortable with good fires. Richwood is undergoing the throes of three big revivals. Sinners will get a fearful bombardment before spring. Wouldn't it be a good plan for someone in the church to announce the names of all arrivals, so that those who are seated will not have to go to the trouble of turning around every time the door opens? It is rather embarrassing to a minister to have about two-thirds of his audience looking toward the door while he is addressing them. Our sidewalks are still in a sad state of dilapidation. Quite a number of them are simply "toe smushers" and "skin peelers" and are the cause of a very free flow of classical language at times. The building of a gutter on the west side of Main Street from Ottawa to Blagrove Streets was sold on Saturday last to the lowest bidder  John Bechtle, getting the job at $1.13 per running foot. This is a much needed improvement and will add much to the appearance of the street, as it will be done in regular city style. The Irwin Corner is being embellished according to the tastes of its different occupants. One has painted his front a blood red and another a somber black. It was a handsome building before. More hitching racks should be put up on Main and the principal cross streets. There is not hitching room to accommodate near all the teams which are in town on Saturdays and many other days. We recommend that a bonfire be built on Main Street every night during the dark of the moon to serve as a light to the pathway over the rough pavement and muddy crossings of our village if a sufficient number of street lamps cannot be put up and kept in good order. The street sprinkler was a wagon that watered the unpaved streets to keep down the dust. Jacob Long will manage the street sprinkler this summer if a sufficient amount of support is guaranteed. He was around soliciting subscriptions the forepart of this week and says that the prospects are not very favorable. We cannot do without a street sprinkler during the hot summer months, and our businessmen had better wake up and subscribe liberally. The people of Richwood were compelled to "bite the dust" so to speak on Tuesday and Wednesday, owing to a failure in the water supply for the street sprinkler. The dry weather during the past two weeks has almost ruined the lawns, and many of our people who have heretofore objected to putting in water works are now talking favorably of the improvement. It is impossible to ever have pretty lawns or perfect fire protection or sewerage without water works. Richwood can boast of a "horseless" street sprinkler. It started on its daily rounds early last Saturday morning. Water this year is furnished by the City Mills. The motive power, by which it is transported about in the big Studebaker sprinkler, is two fine mules owned by Marshal Sloop. Some of the sidewalks in Richwood are continually obstructed with agricultural implements, fence wire, and other merchandise belonging to different merchants. This is a direct violation of the ordinance of the Village, and in case of an accident would hold the Village liable. In case the buildings occupied are not large enough to hold the goods, better rent a larger one. At the meeting of the businessmen of Richwood last Friday evening, James Monroe was selected as night watchman, to succeed D.W. Taylor. I seem to recall that the businessmen still employed a night watchman 50 years later. He was a private security guard who kept an eye on the shops during the overnight hours when they were closed, checking the doors to make sure they were locked, to prevent burglary or other mischief. Nowadays, this duty is entrusted to the police. Only a few of our property owners paid any attention to the orders of the village council to trim the trees about their premises. As a consequence, in many parts of town the streets and sidewalks are in an unhealthy condition because of too much shade. Without a doubt, a new three-story brick hotel will be built in Richwood during the present year. The ordinance against wooden construction was most likely a fire safety measure. Hastings and Williams have commenced erection of their carriage repository on Main Street. It is no longer "criminal" to build a wooden building, since the repeal of Ordinance No. 14. Claibourne now has a new depot, a warehouse, three stores, a blacksmith shop, and the Fairview M.P. Church. There is a postmaster, G.M. Warner, who showed us the site for the new school house which is to be built in the midst of a beautiful grove of trees in the north suburbs. The improvement of the Snediker Road, southwest of town, is supplying a long-felt want in the building of a substantial bridge across Fulton Creek, near the residence of M. Snediker. For some time past, communication between the two sides has been almost cut off by the absence of a bridge and the terrible condition of the ford. Another old landmark of Richwood has disappeared. The old building on West Blagrove Street formerly owned by John A. Cook has been torn down to make room for the new livery stables to be built by Marion Flickinger. It was a log building, weather boarded, and although it stood over forty years, it is said there was not a single decayed log in it. John Horn is completing his handsome pressed brick residence on North Franklin Street by erecting a large porch. The porch has high walls of variegated sandstone. The large square pillars are also of stone and the floor will be of cement. This is the handsomest residence in Richwood. The new Methodist Episcopal Church of Richwood will be dedicated next Sunday by Bishop J.W. Hamilton of San Francisco. It has been in the course of construction since October 6, 1902. The building has been erected at a cost of $20,000 and is a credit to the congregation and community at large. It is fitted throughout with all modern conveniences, including steam heat, electric lights and a handsome pipe organ. Edward B. Scheve, concert organist and pianist of Chicago, will give the first concert presented in the new M.E. Church Friday evening, March 4. 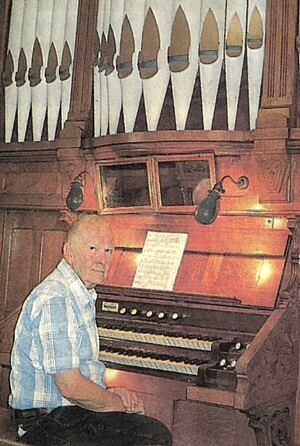 Yours truly, Thomas B. Thomas, amateur organist and pianist of Pennsylvania, gave the 100th anniversary concert on that organ on March 2, 2003. I didn't know it at the time, but a very similar organ was also installed in 1903 just five miles to the east of Richwood. It was at St. John's Lutheran Chuch in Prospect, and that Hinner organ is likewise still in service. According to the Gazette, Keith Becker of St. John's (pictured) performed "a day of music" on October 28, 2012. The first annual commencement exercise of our Union Schools was held in the M.P. Church on last Tuesday evening. Hon. J.J. Burns, State School Commissioner, was present and delivered an address. The third annual commencement of the Richwood High School will be held at the M.P. Church next Friday evening. There is one member of the graduating class. Senior oration  "Be fit for more than the thing you are now doing."  by James Hoover. Although this is the third week of school, many of the boys have been seen lounging about. This is not as it should be. Presumably, "foreign" pupils were those whose homes were not in Richwood itself but on farms outside the village. They could attend school only in the winter, as their labor was needed in the fields the rest of the year. Only unmarried women were allowed to teach school. The Richwood Public Schools close on Friday for a week's vacation. The spring term will commence on Monday, March 10, lasting two months in the higher and three months in the lower grades. Many of the foreign pupils will withdraw at the end of the winter term, as spring work will soon begin. Mrs. Amos Tanner (nee Fronia Chambers), recently married, took first premium at the County Fair for her last class in reading. She has made a reputation as a teacher, and the profession lost a valuable member when she took upon herself the duties of a household and abandoned teaching. The winter school will begin soon. Every district except one has a teacher and is going to start as soon as all are ready. Wages are varying this year; some get as low as $30 per month. Judd Peet left Saturday for Oberlin, Ohio, where he will take a commercial course in the college. Sixty-one years later, my class had 76 members. The town's population had grown somewhat, but more importantly, a much higher percentage of teenagers completed high school. The twenty-fifth annual commencement of the Richwood High School will be held at the opera house Thursday evening, May 26. This year the class consists of nine members. The electric headlight on engine No. 54, which passed through here several times the latter part of last week, gathered quite a crowd and was described as "wonderful" by many of our citizens. The street lights were not turned on Saturday night for almost an hour after the time called for by the contract between the village and the owner of the electric light plant. Farmers coming into town were in great danger of colliding with vehicles on the principal streets, as neither the commercial nor street lights were on. Such negligence will soon drive the trade of the farmers to other towns which have enterprise enough about them to light their streets when dark comes. A new light generator was recently added to the electric light plant of Edward A. Schambs, Richwood, Ohio. It was manufactured on special order by the Fort Wayne Electric Works of Fort Wayne, Indiana, and cost $1,800. It is one of the finest generators ever built by that company. The improvement in our light service is very noticeable since a new machine was installed. Those of our citizens who are interested in electric machinery should call at the plant while it is in operation. The Richwood Light, Heat and Power Company recently incorporated for the purpose of operating the Richwood light plant and constructing and operating a hot water system in Richwood. On April 1, it will be controlled and operated by the following Richwood citizens: O.P. Lenox, C. McAllister, L.G. Peet, Bent Cahill, J.F. Wood and L.P. Albright. Ever since the first of November when the contract with Richwood Light, Heat and Power Company expired, the streets of the town have been in darkness instead of electric lights. Everyone who is compelled to go out after dark must carry a lantern. This is certainly detrimental to the local businesses. The council has been in a tie on the questions of making a contract. Council would like to have 2 a.m. service instead of 1 a.m., but the company claims it would necessitate another man. The current proposition offers to light the streets until 1 a.m. for $60 a lamp each year, using existing lamps. Council states the old lamps on the street are worn out. They were used in lighting the World's Fairgrounds in Chicago in 1893 and were second hand when brought to Richwood 10 years ago. After refusal of a petition for an election to issue bonds to purchase a municipal plant, another petition is presently circulating. A band of musicians gave our town a visit last Friday. They had a Scotch bagpipe (we guess) and two other instruments, which suggested to the mind of the sinner the type of music he can expect in the lower regions. Their point evidently is to be hired to leave town. Coming to Richwood Wednesday, Aug. 18, Welsh & Sands' Great Railroad Show, united with the Great European Aggregation, will pitch its mammoth tents in Richwood for one day only. In St. Louis, it is said their enormous tents were filled to capacity with rare wild beasts, birds, reptiles and marine wonders and a great number of thrilling and novel equestrian and animal acts. All will be exhibited under one hundred and fifty thousand yards of tents made brighter by the new and just perfected electric light. One ticket 50¢, children under 9, 25¢. The band favored our citizens with an open air concert on Saturday evening. The boys progress with the times in music and we hope they may give us many street serenades during the summer. If Hodges had a "museum," it was probably inspired by P.T. Barnum's American Museum of oddities in New York. Chas. Hodges displayed a "Chinese chicken" in front of his museum last week and stated that it would lay 10 eggs a day. It had horns and very large, expressive eyes. S.F. Cratty has secured the management of the Richwood Roller Rink which will be open Saturday evening, Oct. 17. Music by band. Admission: gents 10¢, ladies admission free, skates 15¢. At a ball in Prospect Tuesday evening of this week, Richwood furnished just half the numbers of couples present. Our young people find many attractions in Prospect. This is because there is no entertainment in Richwood and Prospect has more enterprise in this direction. A word to the wise should be sufficient. Ward's magnetic flowing well has made West Bomford Street a popular thoroughfare. One Sunday, it is estimated fully a thousand people visited the well to see it and drink of the magnetic water. Plans are to erect a commodious bath house at the place. An effort is being made to raise sufficient money to build a fine bath house at Varuna Park. This is something badly needed in Richwood. Let every citizen help push the enterprise along. Varuna Park, which was purchased by I. Miller from the company originally owning the same, has, during the past few weeks, been undergoing extensive improvements. The park, which is a natural one, will be fitted up with seats, swings, merry-go-round, etc., making it a fine place for picnics, drives or promenades. On Saturday afternoon and evening, July 30, the biggest dance ever held in Union County will take place at Varuna Park in Richwood. A good orchestra has been secured and a large platform erected for the occasion. Refreshments and Varuna soft drinks will be sold. Admission is free and all welcomed. Sufficient police will be on the grounds at all times to maintain good order. No man should deprive his wife and family of a good local paper. They do not get out from home to learn the news as does the husband and father, and the paper serves to relieve the otherwise lonely hours of absence. It's the worst possible economy to deprive the family of a pleasure so cheaply obtained. This issue completes the twelfth volume of The Gazette and next week, if nothing happens, we will issue the first number of Volume 13. The newspaper is getting up in years and has a firm hold on the hearts of the people. The perfect town is that in which you see the farmers patronizing the home merchant, advertise in the local newspaper and the laborists spend their money with their own tradesmen. This spirit of reciprocity between business and mechanics, tradesmen and laborers, farmers and manufacturers results in making the town a fine one to do business in. On Tuesday, George W. Worden, publisher of The Gazette, purchased the two-story brick building on S. Franklin Street, diagonally opposite the Opera House. As soon as the building is overhauled and the improvements made, the office will be moved, our present quarters being too small for the proper handling of our business. The employees of this office enjoyed a banquet in the basement of the Gazette building on Halloween. C.B. Zuspan's big phonograph furnished music for the occasion and all had a good time. A man stopped me on the street the other day and said we did not publish all the things that happened. We should say we don't! In order to please the people, we must print only the nice things said of them and leave the rest to gossip. Yes, it's a fact, we don't print all the news. If we did, wouldn't it make spicy reading? But it would be for one week only. If we published all that happened, the next week you would read our obituary and there would be a new face in heaven. "All the News" is all right when it is about the other fellow. On Friday last, a team of horses belonging to George Temple, which had been left standing in front of Canan, became frightened and ran away, passing the Grove St. crossing at a lively pace, but were stopped before doing much damage. On Wednesday, H.M. Wright sold the finest team of horses that has been sent out of Richwood for many days to John Isreal, the burglar alarm-clock man, for $300. 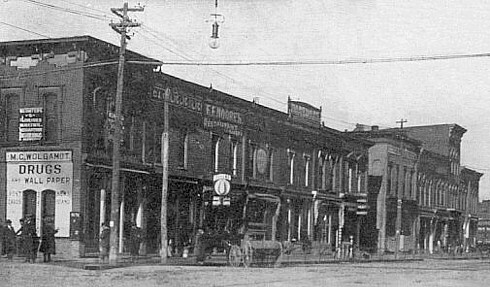 A team attached to a wagon loaded with merchandise for Hornbeck & Hornbeck, of York, ran down Main Street Tuesday, scattering goods promiscuously, but were fortunately stopped by workmen before doing serious damage and were taken in charge by E.G. Randell, who had ridden after them. Nothing sounds more pitiful than the neigh of a horse in the still hours of the night as he stands pawing the ground in the cold and snow, while his master toasts his shins by a warm stove in a saloon or gossiping in some grocery. If such inhumane creatures could be tied on the streets with their faithful friend for one night only, it may prompt them to have their horses shelter from the frigid blasts of a cold winter night. On last Friday, George Orr and his wife were crossing the railroad track near the depot. A young horse which they were driving took fright at an engine and started to run. After a few lunges, it succeeded in upsetting the buggy and throwing the occupants out, scattering eggs and butter in all directions. Mary Orr had her arm broken near the wrist and was otherwise bruised and shaken up. Mr. Orr was also badly injured. Two men came to Richwood last Saturday in a horse and buggy from three miles the other side of Essex and hitched their horse at the rack by Moffitts blacksmith shop. There that poor horse stood from 3 p.m. to 1 a.m. when officer Cunningham very properly took it to Flickingers stable. The two men, supposing it was stolen, walked the nine miles home, but one returned the next day and got it after paying $1 for its keeping. Any man who will let his horse stand 10 hours on the street on a cold night without feed or blanket should be put to work at the Dayton work house. "Major," the imported Belgium horse, may be found at F.O. Johnson's stables during the 1904 season. He is regarded as one of the best draft studs in the area. If you're driving home and "the horse knows the way to carry the sleigh," you can take a nap. Dr. Charles Thompson was returning late night from a trip to Marysville where he had purchased a new buggy and had attached it to the rear of his old buggy. Becoming exceedingly drowsy he was soon "snoring to beat a brass band." Overtaken by neighbors in a passing buggy, he was aroused from his slumber to find his new buggy gone. Driving back about three miles, he found his buggy standing in the middle of the road, and thusly arrived home in time for breakfast. He did not relate his experience; however, some of the "boys" about York knew it all and are having lots of fun with the foxy medicine man.